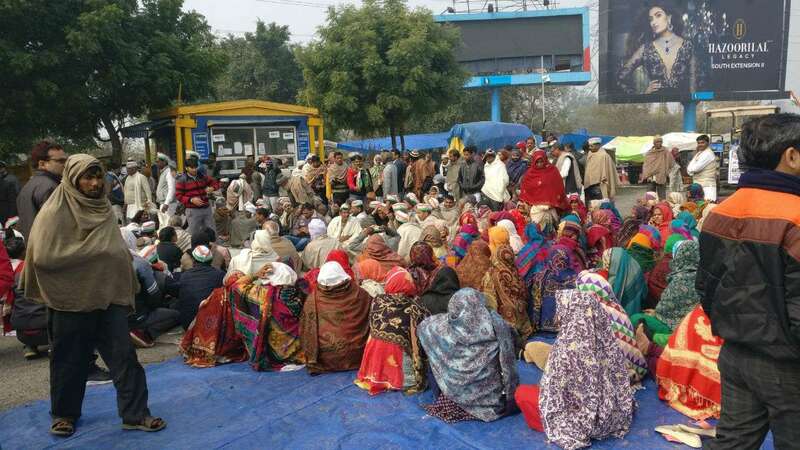 Feb 2 (AZINS) Farmers on Saturday blocked the Delhi-Noida (DND) flyway, the second day of their agitation demanding fourfold compensation for their land acquired by builders. The situation has turned tense as the police personnel prepare to remove them from the flyover. Senior officials including SSP Gautam Budh Nagar and District Magistrate are present at the spot to ensure that the place is vacated as soon as possible. The farmers have assembled at the toll plaza at the flyway connecting national capital to Uttar Pradesh's Noida. The flyover was briefly shut on Friday as a large number of farmers marched on the road in a rally. It was opened later and traffic was normalised in the evening. "We had a word with them yesterday as well to corporate with us. They had agreed to it. However, they were again found here this morning. We are requesting them to move as all the things (decisions) take time. We have requested them to move to collectorate office or Ram Leela ground. However, they want to meet the Prime Minister (Narendra Modi) and go to the PM office," said BN Singh, DM Gautam Budh Nagar. He added that police will remove them forcefully if the situation goes out of hand. There are nearly 500 farmers sitting at the protest site next to the DND toll plaza. Many of them spent the night in the open on the road. Meanwhile, the farmers claimed that they have only been given assurance from the past 9 years and no real action has been taken. "We want to go to the PM residence and want his assurance. Things should be on paper. He is our PM, we have all the rights to meet him. Our demands should be listened and met otherwise we will continue to protest," said Manveer Tewatia, kisan leader. He further said they will not create any issue for the commuters. "We will continue to fight till our last breathe. No one in the country listens to the pain of the farmers. Even if they lathicharge, we will remain unmoved and won't hit them back, he added. On Friday thousands of farmers from different villages of Gautam Budh Nagar district had marched towards Delhi, raising slogans and causing severe disruption of traffic on the Delhi-Noida flyway which had to be then shut causing inconvenience to commuters. The agitated farmers have alleged that builders, who took land from farmers, have laid the foundation stone for a degree college, but construction is yet to begin. The protesters want that those farmers who did not sell their land to builders should be provided a channel for passage of water for irrigation purposes. They also want immediate relief from the Income Tax department. The farmers have demanded that the affected families should be either provided employment or give Rs 5 lakh as compensation for self-employment. Furthermore, they have demanded creation of 100 bighas of land for Gram Sabha. In November last year, more than one lakh farmers, belonging to 200 farmers' organisations, staged protests in different parts of Delhi to push their demands against rural distress, including implementation of the MS Swaminathan Committee report, farm loan waiver and better Minimum Support Price (MSP) for their agricultural produce.